Rally spearheaded community-wide advocacy efforts that have resulted in new cancer research funding for children, adolescents and young adults (AYA), within the Department of Defense Medical Research Program. In 2017, for the first time ever, cancers in children and AYAs received $3.3 million and in 2018 they received $7.9 million. Currently researchers can apply for FY2019 funding. The community is now advocating for a $30 million-dollar standalone program for cancers in children and AYAs for FY2020. Please sign on in support of this request. 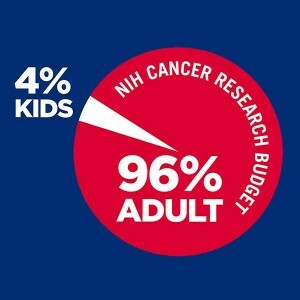 While 96% of NIH cancer research dollars advanced adult treatments, kids are left with a mere 4% of the research funds. Dean Crowe, Rally’s CEO and founder, attended a roundtable discussion on how the childhood cancer community can work together to increase federal funding and get access to more drugs for kids battling cancer. The Department of Defense (DoD) was identified as an area within the federal government where additional funding could be found to help advance research. Rally took the lead on advocating for funding from the DoD’s Congressionally Directed Medical Research Programs (CDMRP). Through the CDMRP, the DoD has a $1.5 billion medical research budget. Dean wrote a white paper making a strong case that research for cancers affecting adolescents, young adults (AYAs) and children should be included in this budget. More than 86% of the active military fall within the NIH’s definition for AYAs, which is 15-39 years old. Of the 86% of the active military, almost half are 25 years old or younger, and almost 50% have children. The cancers being researched by the CDMRP have an average age of diagnosis of 65 years old. Cancers that our active military and their children are diagnosed with are basically nonexistent in the CDMRP. 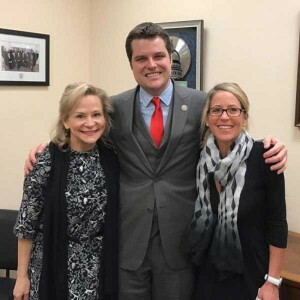 Dean Crowe and Rally Pensacola Director Cindi Bonner with Congressman Gaetz in March 2017. In 2016, Dean, along with The Nicholas Conor Institute (TNCI) and others in the childhood cancer community, advocated to the DoD subcommittee members of Congress to include cancers that affect AYAs and children within the DoD’s medical research budget. Rally and TNCI held a briefing in D.C. and organized a nationwide call-in campaign with the help of The Truth 365. As a result, the House, the Senate and ultimately the President approved of the DoD FY2017 budget, which includes report language for AYAs and pediatrics in the $60M Peer-Review Cancer Program. 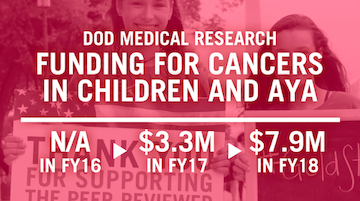 This is the first time that AYAs and all pediatric cancers have been included in the DoD CDMRP budget. It is unprecedented how quickly we received report language, and we are very grateful that the report language has continued through FY2019. Our ultimate goal is to have our own program (line item in the CDMRP). Currently, we are collecting signatures in support of our FY2020 DoD CDMRP request for a $30 million dollar stand alone program for cancers in children and AYAs. Congressman Scott Peters (D-CA), Congressman Michael McCaul (R-TX), Congressman William Keating (D-MA) and Congressman Matt Gaetz (R-FL) have submitted the appropriations request for FY2018. Join them in addition to 220 organizations, 550 individual patient advocates, and 50 researchers and oncologists from all across the country and sign the letter of support. Rally Advisory Board Member Isakson Applauds Approval of First Gene Therapy Treatment in U.S. Thank you Rally Advisory Board Member Senator Johnny Isakson for your commitment to kids fighting cancer. We appreciate your work on the Advancing Hope Act and 21st Century Cures Act, both of which paved the way for the FDA’s historic approval this week of the first cell-based gene therapy available in the U.S. The new therapy was approved for certain pediatric and young adult patients suffering from a form of acute lymphoblastic leukemia, the most common childhood cancer in America. The Childhood Cancer Survivorship, Treatment, Access, and Research (STAR) Act is the most comprehensive childhood cancer bill ever taken up by Congress. It would expand opportunities for childhood cancer research, improve efforts to identify and track childhood cancer incidences and enhance the quality of life for childhood cancer survivors. Expanding Opportunities for Childhood Cancer Research: Due to the relatively small population of children with cancer and the geographic distance between these children, researching childhood cancer can be challenging. As such, the Childhood Cancer STAR Act would authorize the National Cancer Institute (NCI) to expand existing efforts to collect biospecimens for childhood cancer patients enrolled in NCIsponsored clinical trials to collect and maintain relevant clinical, biological, and demographic information on all children, adolescents, and young adults with cancer. Improving Childhood Cancer Surveillance: Building upon previous efforts, this bill would authorize grants to state cancer registries to identify and track incidences of child, adolescent, and young adult cancer. This funding would be used to identify and train reporters of childhood cancer cases, secure infrastructure to ensure early reporting and capture of child cancer incidences, and support the collection of cases into a national childhood cancer registry. Improving Quality of Life for Childhood Cancer Survivors: Unfortunately, even after beating cancer, as many as two-thirds of survivors suffer from late effects of their disease or treatment, including secondary cancers and organ damage. This legislation would enhance research on the late effects of childhood cancers, including a study on insurance coverage and payment of care for childhood cancer survivors; improve collaboration among providers so that doctors are better able to care for this population as they age; and establish a new pilot program to begin to explore innovative models of care for childhood cancer survivors. Ensuring Pediatric Expertise at the National Institutes of Health (NIH): The Childhood Cancer STAR Act would require the inclusion of at least one pediatric oncologist on the National Cancer Advisory Board and would improve childhood health reporting requirements to include pediatric cancer. Rally works to raise awareness to increase federal funding for childhood cancer research and strengthen policy around drug development by advocating for legislation that will impact the childhood cancer community. To develop better treatments and ultimately a cure for childhood cancer, it is essential that we work alongside policymakers. Become a Rally Advocate. Sign up to receive our Rally Advocate emails for the latest advocacy information. As a member of the Alliance for Childhood Cancer, Rally has partnered with more than 30 national patient advocacy groups and professional, medical and scientific organizations in the fight against childhood cancer. Established in 2001 to be a voice for the youngest cancer patients, the Alliance for Childhood Cancer provides a forum for patient advocates, including cancer survivors themselves and parents of kids with cancer, health care professionals and others involved with cancer care. The Alliance meets regularly to share concerns and generate ideas that advance research and policies to improve the lives of families affected by childhood cancer. In August 2017, the RACE for Children Act was signed into law as Title V of the FDA Reauthorization Act to amend the Pediatric Research Equity Act (PREA). The RACE for Children Act (Research to Accelerate Cures and Equity for Children Act) requires companies developing targeted cancer drugs for adults to develop those drugs for children with cancer as well. The RACE for Children Act is not new law. It updates PREA so that the FDA may now require pediatric assessments when the molecular targets of the drugs under FDA review are substantially relevant to children’s cancers. Under the RACE for Children Act, all cancer drugs in the development pipeline will be candidates for study in children’s cancers. Thank you to the childhood cancer community for advocating for the FDA law to be updated. 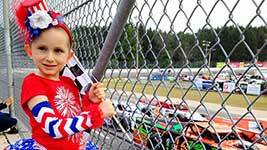 The passage of RACE is a huge step in the right direction to get better and newer treatments to kids fighting cancer. Send a personalized letter to your Senator or Congressman or call your elected office and ask them to support public policies that will improve the lives of those affected by childhood cancer. Encourage your Congressman to join the Congressional Childhood Cancer Caucus, or if they’re already a member, thank them for their dedication and commitment to childhood cancer. Share your personal story about why childhood cancer research is important to you. Email your story to Emma@RallyFoundation.org.